I’m sure you know very well how crucial it is for a business to deliver a strong search engine experience. There is plenty of data that highlights it, after all. 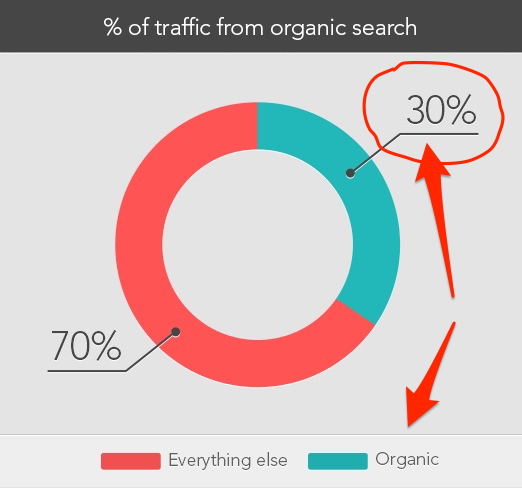 For example, we already know that organic search attracts around 30% of overall website traffic. And achieves the second highest ROI. But which strategies are working particularly well for enterprise organizations? And what opportunities and challenges do they face with increasing search visibility? That’s what you’re about to discover from this post. Recently, we developed the largest state of enterprise SEO survey to date. And in this article, we highlight some of the most critical insights on the impact SEO has on a business and the opportunities available to companies to improve and increase their organic search visibility. 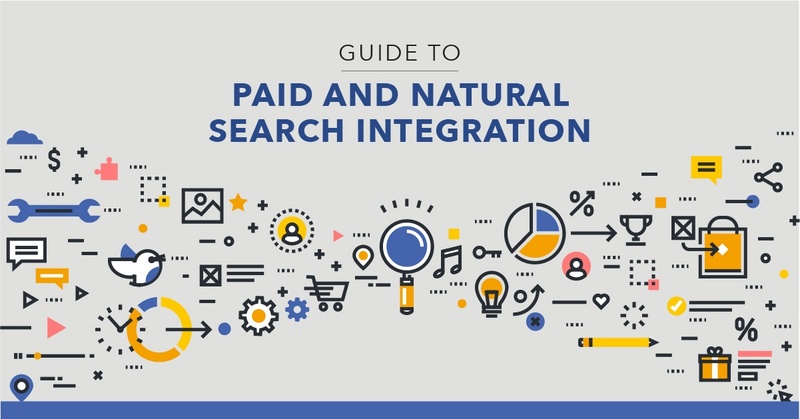 Although the process of SEO adoption across the full marketing team in enterprise level companies was a hard fought battle, the SEO’s stake in a business has been embraced. And what’s more, it's consider it critical to their business success. And when you break this down by business size, it turns out that only 6.5% of enterprise-level organizations place themselves in that category. 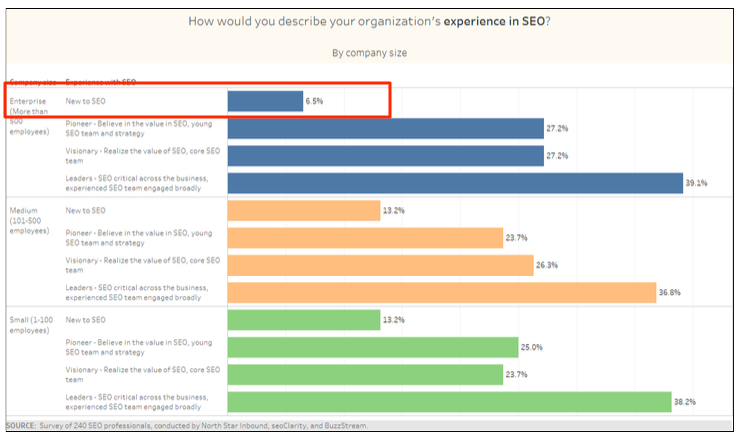 However, 39.1% of them consider SEO as critical to their business and have built an experienced SEO team. Even those most enterprise-level companies have embraced SEO by now AND they also see the return from investing in SEO. It's important that to continue to prioritize search engine optimization in their budgets and resources. We believe this is the opportunity to continue to invest and measure to deliver the proof of the effectiveness as a viable channel for growth and sales. 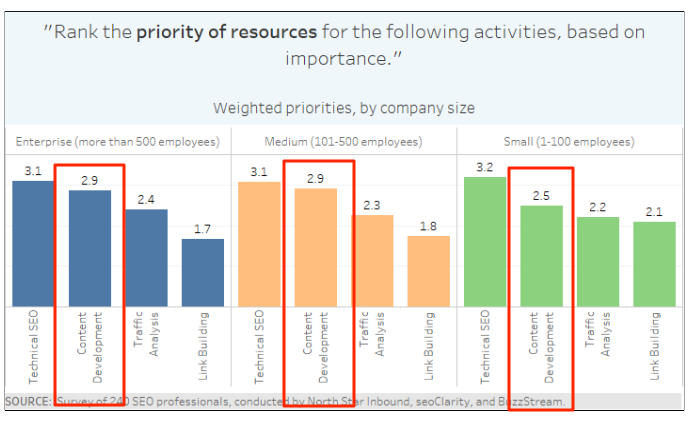 There’s a huge inconsistency in SEO budgets among organizations. And what’s even more intriguing, there seems to be no correlation between budgets and organization size. Our research discovered that although enterprise-level organizations do tend to allocate higher budgets to SEO than smaller enterprise companies, many of them still spend low amounts on the channel per month. 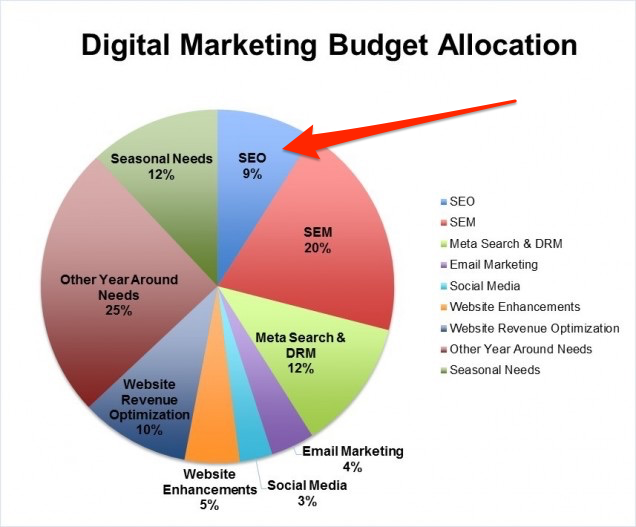 As many as 11% of enterprise organizations we surveyed had a monthly SEO budget of less than $1,000. And only 20% are spending between $5,000 to $10,000 a month. This disparity might come as a result of a different understanding of SEO within organizations. Although the majority of the organizations we surveyed embraced SEO, not all of them consider it as a more valuable channel than others. For example, according to the data from Hebs Digital, hotels typically allocate less than 10% of their digital marketing budget to SEO. Because, as we’ve also discovered, there is a strong correlation between budget and success rate for businesses. It, therefore, would suggest that to increase the channel’s effectiveness, it might be worth upping the monthly spend you’ve allocated for the SEO team. I admit that this finding came as a surprise. You see, as it turns out, the average SEO team consists of 2 to 5 people. What’s more, 23% of companies had only one person working on their organic visibility. Because, as you can see from the graph below, we’ve also discovered that enterprise organizations with more than 21 people on the SEO team considered themselves more successful in their efforts. Plus, only 13% of in-house teams felt confident about their overall progress and abilities. Something that could be connected to their size, and wealth of their responsibilities. And so, it might be worth considering whether you have enough people to actively improve your organic visibility. In spite of the great adoption of SEO, organizations still struggle to prove the value of the channel. Although all agree that traffic analysis is the most relevant method of monitoring SEO progress, they diverge as to how to do it (and also, what tools to use). Similarly, in-house teams and agencies differ on various KPIs they should measure. For example, each targets a different type of keywords - national or local. To properly measure and demonstrate the ROI, you need to identify KPIs that are unique to your business and highlight progress in areas related to your organization’s goals. In-house SEOs name creating the right content their number one challenge. 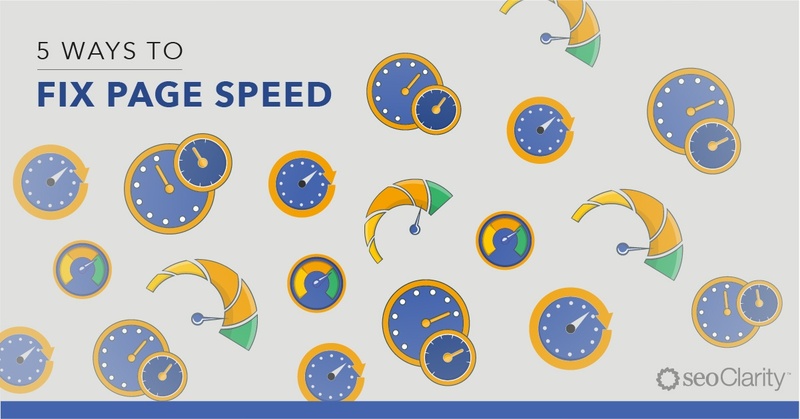 At the same time, SEO teams confirm that content is their top priority right after ensuring proper optimization of their website’s technical setup. 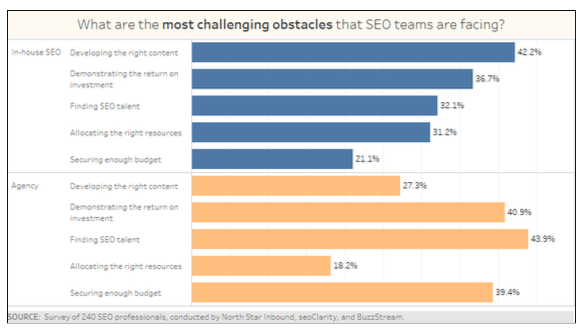 SEO teams struggle with producing more relevant content. One way to help them solve it is by incorporating tools that can make topic ideation easy. Other, allocating higher budgets to allow for a more data-driven approach to creating content that would engage and resonate with the audience and their specific buying needs. I’m sure you’ve already heard of Google’s upcoming move to a mobile-first index. We’ve discovered that more and more brands are preparing their websites for it. This is great news, meaning that the majority of companies shouldn’t experience any problems or traffic loss as a result of the new index. In fact, our survey found that instead of launching a mobile version of the site, those most companies focused their efforts to launch a responsive site that will work across all platforms - desktop and mobile. That was consistent for all companies, regardless of whether they are part of an agency or in-house organization. The mobile-first index will be a major shift in rankings and online visibility. For the majority of organizations operating two separate versions of the site - mobile and desktop, the change might result in loss of rankings and online visibility. Prioritizing responsive layout means overcoming major optimization challenges before the new index even launches. Want to learn more? Download the full copy of “The State of Enterprise SEO” report here.